Thomas' Fund at CCLG is raising funds to support research into low grade glioma. Thomas was a lively and happy little boy who enjoyed his bikes, swimming and going to the beach. At just over 18 months old his appetite diminished and he started vomiting. After a few trips to the GP’s, paediatricians and A&E, Thomas was admitted to hospital in April 2013. An MRI scan revealed he had a tumour in the top of his spinal cord and extensive spread throughout the lining of his spinal cord and brain. Two days later he had surgery on his spine to obtain a biopsy and had to lie flat for five days. The biopsy results weren’t clear but a diagnosis of pilocytic astrocytoma was made. The following week Thomas deteriorated again and required further neurosurgery to insert a shunt into his brain to drain fluid into his abdomen. He started chemotherapy two days later. Over the following two years Thomas trialled four different chemotherapy protocols to try to gain control of the tumour. He suffered from pain, peripheral neuropathy, kidney damage, constipation, diarrhoea, sickness and a weakened immune system requiring numerous hospital admissions for antibiotics. 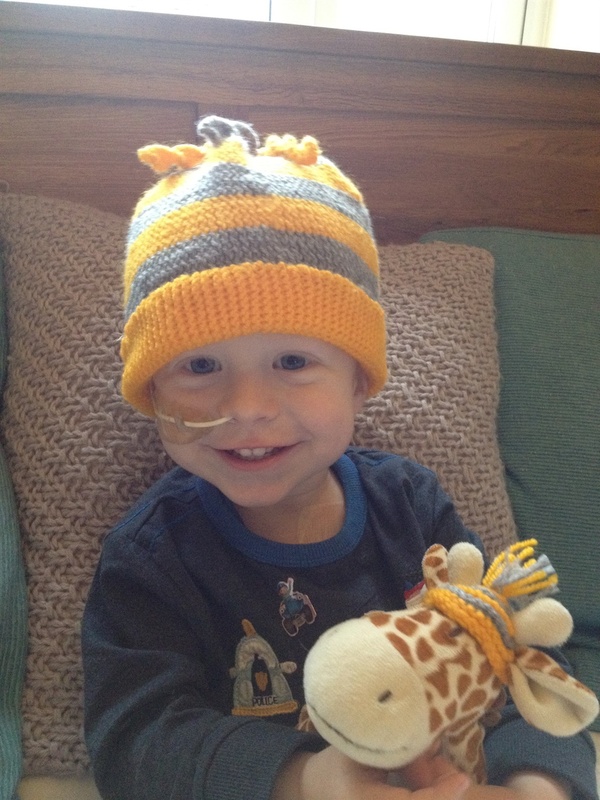 In total Thomas had 77 doses of chemotherapy and 18 anaesthetics, 9 of which were for surgery. He had 2 admissions to PICU for complex seizures. Unfortunately the tumour continued to grow and Thomas suffered from behavioural changes, agitation, speech loss and seizures. Given his problems, quality of life and failure to improve, we decided to palliate Thomas in August 2015; he passed away in November 2015 at the age of 4. Thomas was inseparable from Geoffrey the Giraffe and is remembered for his gorgeous hair (which weirdly didn’t fall out with carboplatin), his big blue eyes, and his amazing stubbornness; after a complex and particularly serious seizure which left him with temporary arm and leg weakness he decided he would rehab himself back to full mobility – and after a few hair-raisingly wobbly days he was back to his usual zooming around. He was surfing in Cornwall a week or two later! Since his death we have learnt why Thomas did not respond to treatment. More tissue samples were analysed which showed a newly recognised type of tumour - disseminated oligodendroglial-like leptomeningeal tumour of childhood. It has yet to be classified on the WHO grading scale and is often hard to distinguish from low-grade glioma. The diagnosis of these tumours is notoriously difficult and due to their rarity there has been very little research done on either the tumour characteristics or which treatments are effective. It is a progressive disease with no effective treatment at the present time. Thomas’ tissue is the first of its type to be banked with CCLG and so we hope to help raise funds into more research for effective treatments and to help current treatments to have fewer side effects. From this page you can make a donation to Thomas' Fund, or start your own fundraising page for Thomas' Fund. You can also donate £5 by texting CCLG 5 THOMAS to 70300.